These are seriously addictive. 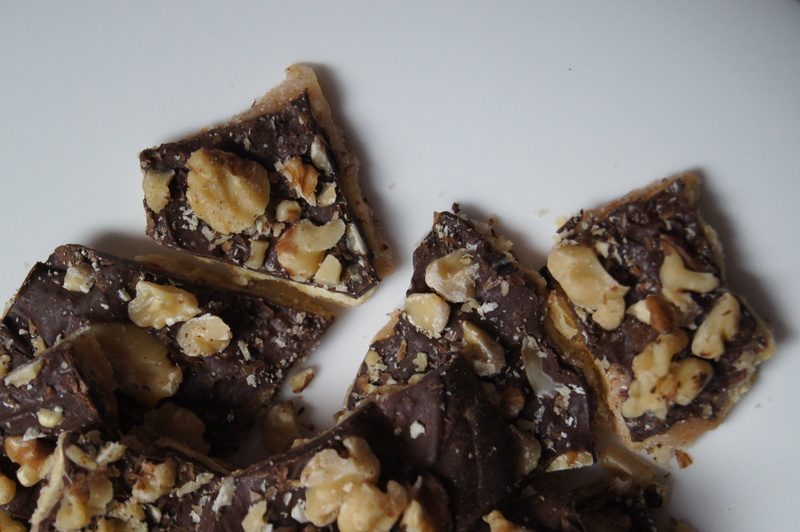 I’ve always called them Toffee Squares, though technically they are more like brittle or bark. I’ve even heard them referred to as crack, which is a more accurate description. Honestly, it doesn’t matter what you call these. Your mouth will be too full to call it anything because having one is totally impossible. It’s a proven fact. You’ll see for yourself when you make these. You can’t help but to swear – in a good way – when you have these because they are so delicious. And incredibly simple to make. Maybe it’s not the healthiest thing you can make, but sometimes you just have to say, “F*#k it!” and go for it. See, swearing can’t be helped. Since the very kind parent at my mother’s daycare gave them to us at Christmas, I usually associate them with the holiday season. That’s when I make them more often and over the years have tweaked the recipe a bit. But they’re good year-round too. 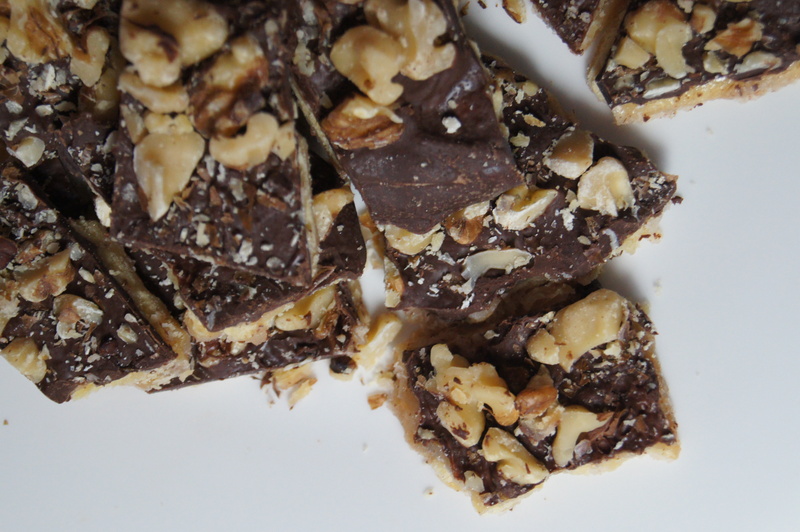 They are perfect to bring to parties and even better when you make them as gifts. 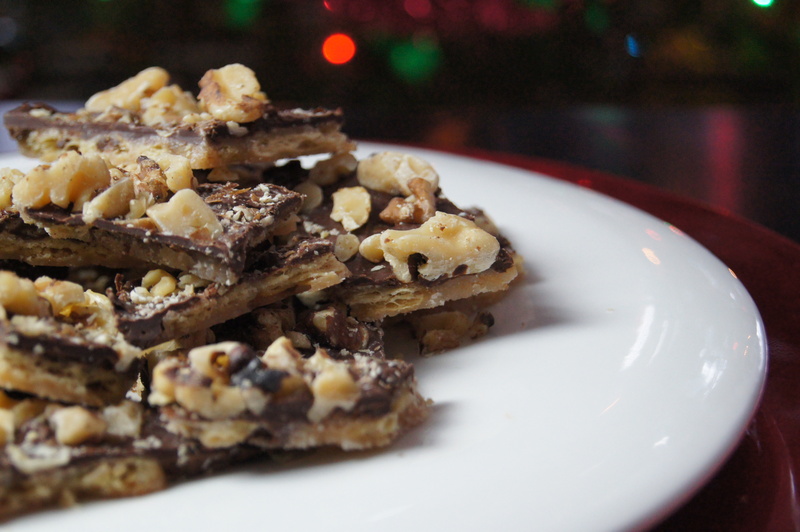 I haven’t met one person that I made these for that wasn’t enthused about getting a container of toffee squares as a present. 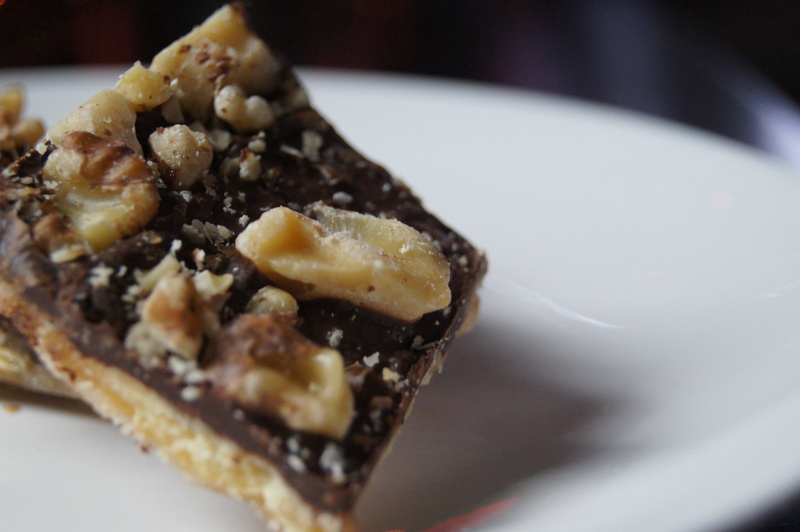 I’m so thankful for the parent at my mother’s daycare that introduced these toffee squares to me. And I’m thankful for all the parents and kids that were a part of my mother’s daycare for so many years. What an amazing group of people! Though, a lot of the “kids” are adults now, they’ll forever be the adorable, fun, loving babies and toddlers that I knew – even if they’re all now taller than me. Two of the toddlers in the daycare were actually the ring bearer and flower girl in my wedding. And they were incredibly cute! My sons were fortunate to also be enrolled in my my mother’s daycare. And they’re also incredibly cute! Even though my mother is now retired and her daycare has been closed for a couple of years, a lot of the parents still keep in touch with her and are just as kind to her now as they were then. It’s most likely because my mother is a sweet, generous woman, who took such loving care for all the children, as if they were her own. And the kids ate well! My mother would make things like pancakes and eggs for their breakfast and for lunch they would get Filipino adobo and rice. When I moved out I was having some sad, cold sandwich for lunch while these lucky kids were having five course meals. I was so jealous. When one little boy graduated from the daycare and went onto kindergarten he cried during lunchtime because there wasn’t any rice and it wasn’t my mother’s cooking. I feel you, little dude. 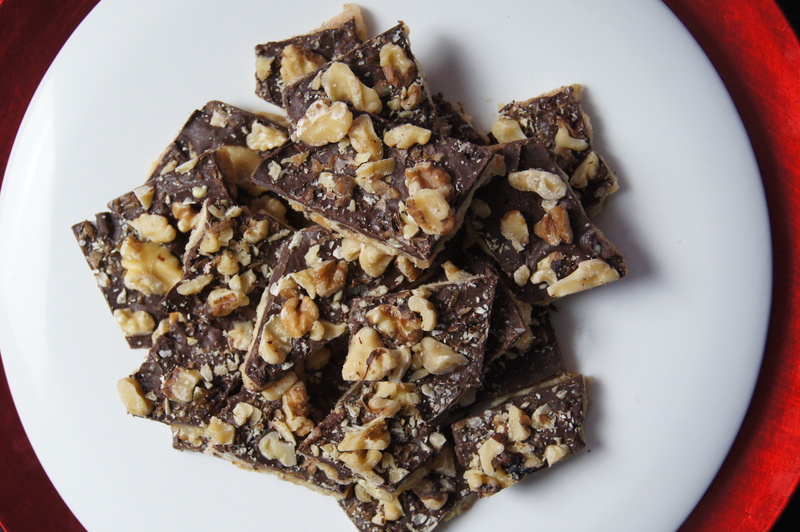 For me, these toffee squares not only taste incredible, but they remind me of happy times, like my mother’s daycare and all the wonderful kids and parents that were a part of it for over 25 years. Butter a baking sheet and line with the saltines. In a small saucepan melt the butter. Once melted, add the sugar and mix together. Let the butter/sugar mixture come to a slight boil and let boil for 3 minutes. Pour butter/sugar mixture over saltines, making sure to cover them completely. Bake the saltines for 5 minutes. Once out of the oven, the saltines may separate from each other. Arrange them with a rubber spatula or spoon back in place, making sure each saltine is touching. Pour the chocolate chips over the saltines and place back in the oven for 30 seconds to one minute. Spread the melted chocolate over the saltines, making sure to evenly cover the entire surface. 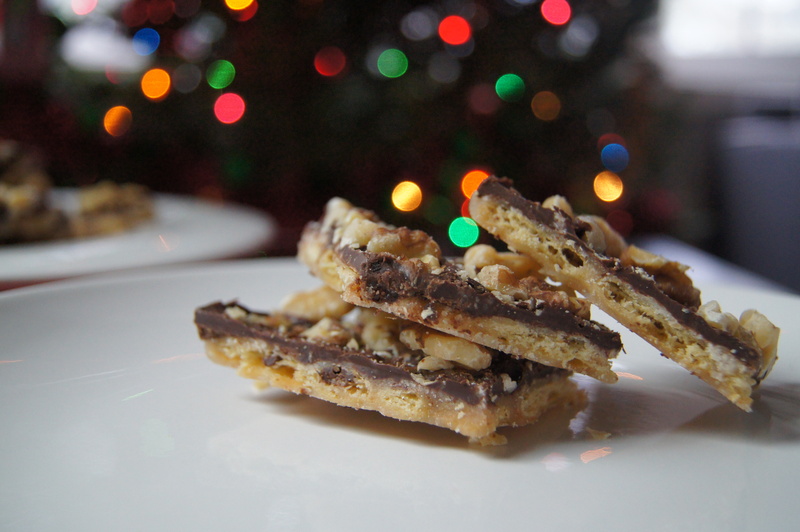 Sprinkle the chocolate covered saltines with nuts. Press the nuts into the chocolate so that they will stick. Refrigerate for about one hour or until the chocolate is solid. 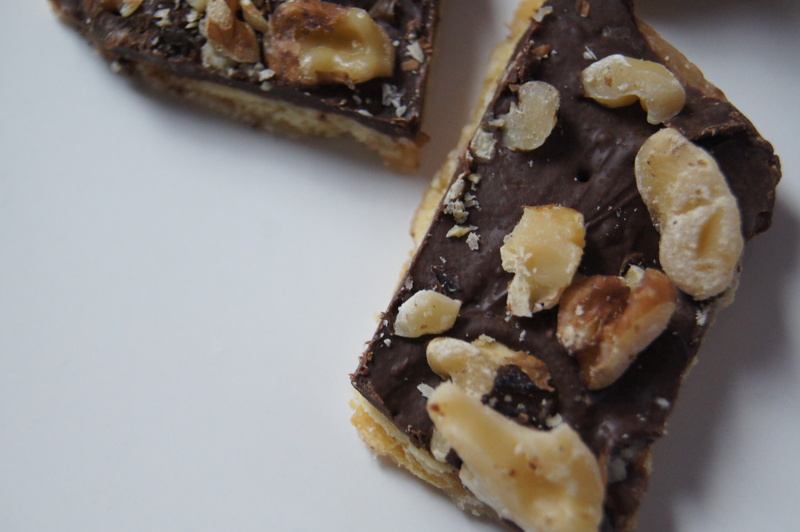 Once solid, break the toffee squares with your hands or cut with a sharp knife.